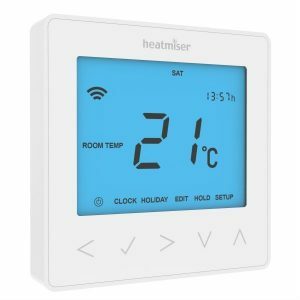 With the Heatmiser Neo range it is now very easy to control your room thermostats using an app via your smartphone. The thermostats are stylish and they come with a neoHub that connects to your broadband router. The thermostats are available in hardwired (neoStats) and wireless (neoAir) version. They communicate with the neoHub to offer a reliable network system. They are easy to programme, providing all of the options across the bottom of the back lit display. Self learning preheat calculates the amount of heat up time required to ensure your home is warm when you wake up and also return home. This is automatically optimized throughout the year to save you money and will automatically detect any changes in your home that causes the preheat time to change. Temperature Hold Facility allows you to hold a set temperature for a specific duration – ideal for parties. After which, the thermostat will revert back to the programmed setting. Key locking is standard on all of the Neo Series and is an excellent way to reduce tampering of the heating system. The Neo series incorporate a back light, which turns off automatically when not in use. The neoHub connects to your router and can control up to 32 Neo thermostats. The Hub is the brain of the system. Use an ethernet cable to connect to your router. Remote updates will keep the system performing to the highest levels. Once you download and install the neoApp on your mobile device, you’ll be surprised how easy it is to have access to your multi zone heating system from your own smartphone. Heatmiser Neo works on Android, iPhone, iPad, Apple Watch as well as Windows Phone and you can share the App with everyone in your home. Underfloor Heating Systems Ltd are proud to use Heatmiser as our electrical control supplier. While we’ve carefully chosen the best pipe manufacturer in Henco (Belgium) and the Dumser Watts manifold (Germany), it is simply excellent to complete the kits we supply with a British manufacturer. You can view our smaller and medium sized kits by visiting our online underfloor heating store within our website. For any larger projects please forward us your floor plans by email to info@underfloorheatingsystems.co.uk.